Diva Devotee: [Review] Brandy Featuring Chris Brown- "Put It Down"
[Review] Brandy Featuring Chris Brown- "Put It Down"
Brandy is back, and doing what she does best: taking risks. Teaming up with producer Bangledesh and featuring a verse from Chris Brown(yuck! ), the track, Put It Down, sounds like nothing else out there at the moment. A good thing for anyone sick to death of the cookie cutter, Euro-dance/pop sound that is strangling the charts, but one that may ultimately pose a big risk to its success if people aren't ready to put their glow sticks down just yet. Put It Down starts with its looped stuttering chorus of "I'mma put it down, you can fall in love" and does its job of grabbing a listener's attention and wrong-footing them into thinking a fast paced, busy, romp is to ensue. Instead, heavy, dirty, horns kick in, luring a listener further in, and the production takes up a mid-tempo speed; evoking a dark midi-feel like that which Missy Elliot and Timbaland were pushing on the excellent and groundbreaking Supa Dupa Fly album in the 90's. The simple, sparse adornment of the track has an empty foreboding and masculine feel to it, but it allows Brandy plenty of space to showcase that gorgeous voice. Taking the understanding of rhythm and flow she showcased as alter rap ego "Bran'Nu", Brandy skilfully merges it here with her singers' knowledge of melody and pitch. The result is a new style of delivery from the star that manages to be aggressive enough to match the track's menacing feel, but one that doesn't lose the identifiable tone, timbre and style of Brandy's singing voice. 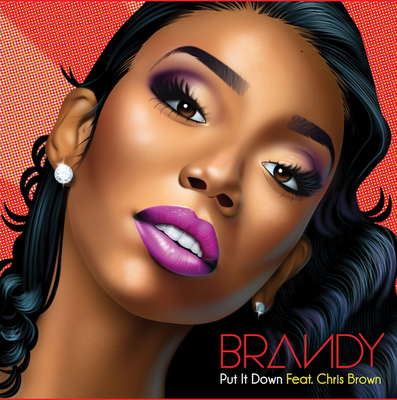 Fans of Brandy's trademark harmonies need not worry, as her skill at layering her voice really comes into its own during the middle-eight of Put It Down. As if from nowhere, a choir of Brandys descend onto the track, bathing the listener in wave after wave of layered harmonies that cleverly warm and sweeten the sound. Its a brief, but satisfying respite from the heaviness of the track, and works brilliantly in breaking it up, and stopping the looped horn from becoming monotonous or boring. Don't get me wrong, I'm not relinquishing my glow sticks any time soon, but I'm loving Put It Down. I'm just keeping my fingers crossed that radio loves and embraces it too, because its support is going to be crucial in Put It Down reaching a chart position fitting of the occasion that is the return of Brandy Norwood! As for Chris Brown, [see Gif] I ain't here for you, and this track, and Brandy's comeback, certainly didn't need you. Put It Down available for digital download on May 8. Very true, I am loving this too! But then something about her voice captivates me, and yes the less said about that revolting little rodent Chris Brown the better. Hmmm...catchy song,but something about it makes me feel that's not great comeback single. Can't put my finger on it. This song is great! Chris Brown's part is so not needed but if he absolutely had to be on this track, why did he have to rap??? I'd actually rather hear him sing.